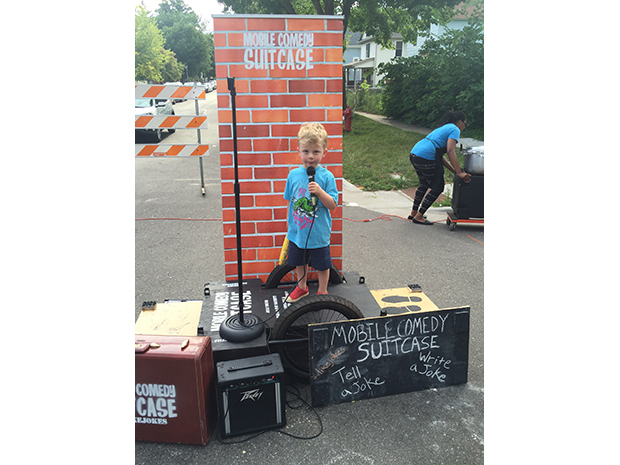 The Mobile Comedy Suitcase is a tiny mobile comedy stage. It's on a trailer pulled behind a bike. It looks like a suitcase that opens up and can be turned into a stage with a fake brick wall backdrop. Everyone can tell a joke. Jokes are a great tool for amplifying voices. Within a joke is contained a microcosm of art, culture, and human experience and, when done right, a joke can cause an involuntary shared human experience, laughter. 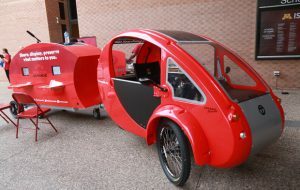 The Mobile Comedy Suitcase is a tiny mobile comedy stage on a bike trailer. 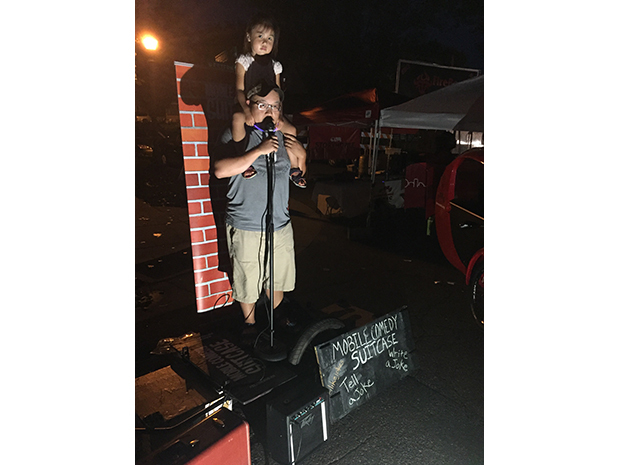 In addition to a stage it features a fake brick wall backdrop, a mic stand, and an amplifier. Activities on the stage include writing original jokes, telling classic jokes from joke books, telling original jokes and learning various styles of joke telling and joke delivery. 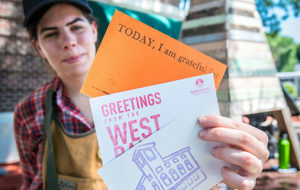 These activities are facilitated by artist and educator Levi Weinhagen (and other guest comedy artists when needed). 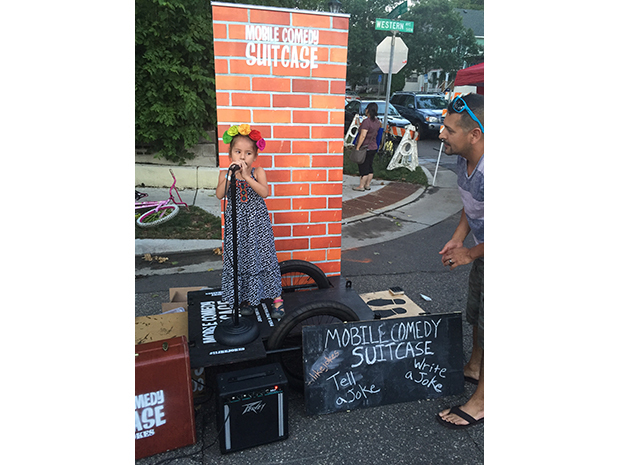 The Mobile Comedy Suitcase has traveled to public events like festivals, community gatherings, street fairs, open streets and night markets. creates opportunities for people to invent and share jokes, stories, and anything else they find funny. We’ve had jokes told by infants in the form or comedy breathing on the microphone, people in their 90s and by many non-English speakers. All to great delight and success. 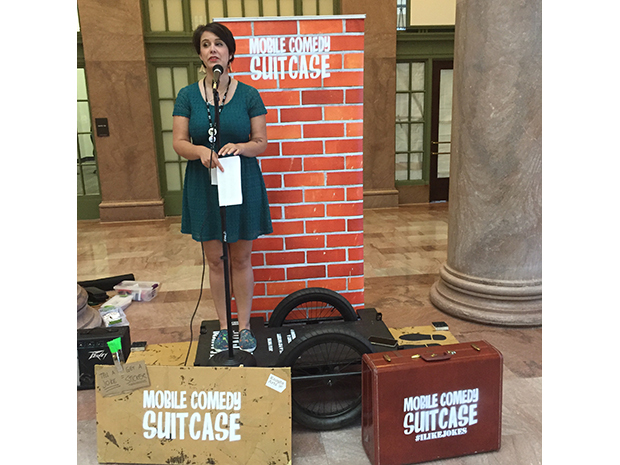 Everyone who tells a joke on the Mobile Comedy Suitcase stage gets a comedy prize. We also have joke writing worksheets and official Mobile Comedy Suitcase stamps to certify any jokes written and performed on the tiny stage. Standard Neighborhood Event Rate: $200 includes set-up and staffing of Mobile Comedy Suitcase with supplies for two hours. 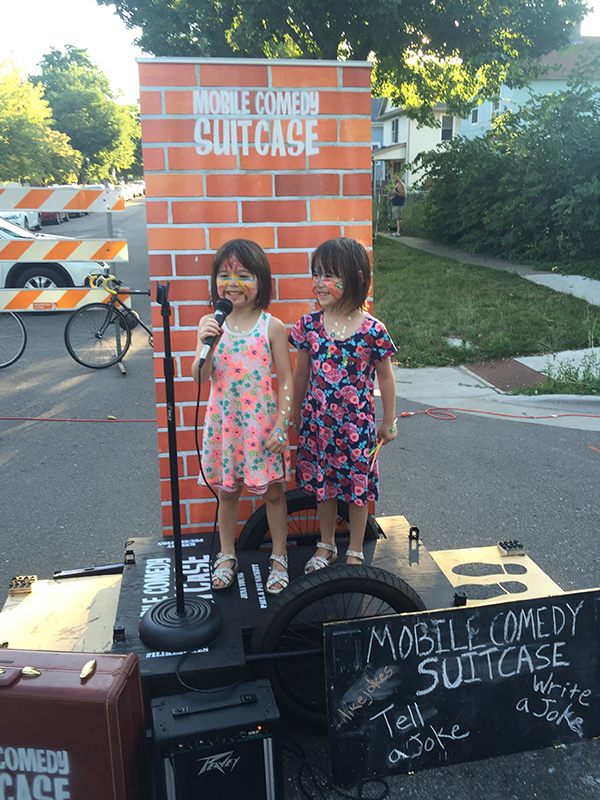 $200 includes set-up and staffing of Mobile Comedy Suitcase with supplies for two hours. Additional hours available at $100/hr. Can bring in pre-written jokes on specific theme and topic for participants to tell as well as facilitate the writing of jokes that fit a theme. 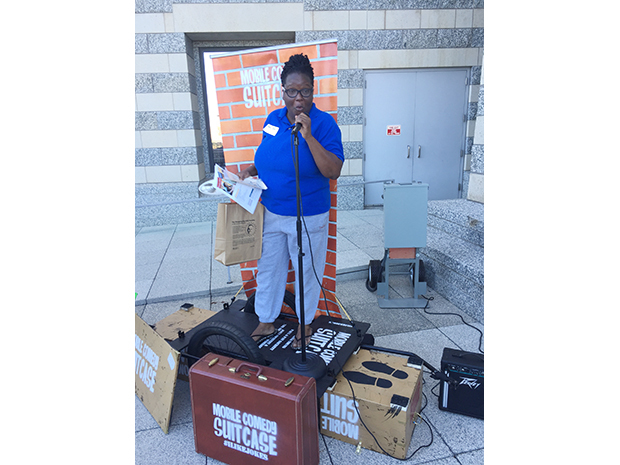 $400.00 includes set-up and staffing of Mobile Comedy Suitcase with supplies for two hours. Additional hours available at $200/hr. Power required for amplification, but joke stage works without amp if unavailable. 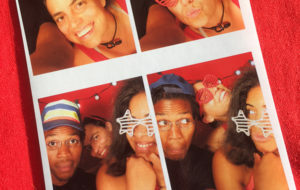 Levi is a podcast producer, theater maker, communications professional and educator. He's a teaching artist with COMPAS & runs a theater company.